After the necessary training to “charge batteries”, up to two people may compete with a virtual athlete in an energetic sprint race to challenge themselves and once they pass the finish line, they can receive the video recorded of the race by e-mail. This is the augmented reality experienceCuatroochenta has developed through the Ros agency for the pavilion of EDP energy multi-national, one of the main energy company group in Spain and Europe, for the 60th Asturias International Trade Show (FIDMA). EDP and Ros jointly devised a mini-stadium honouring amateur athletes and sportsmen. 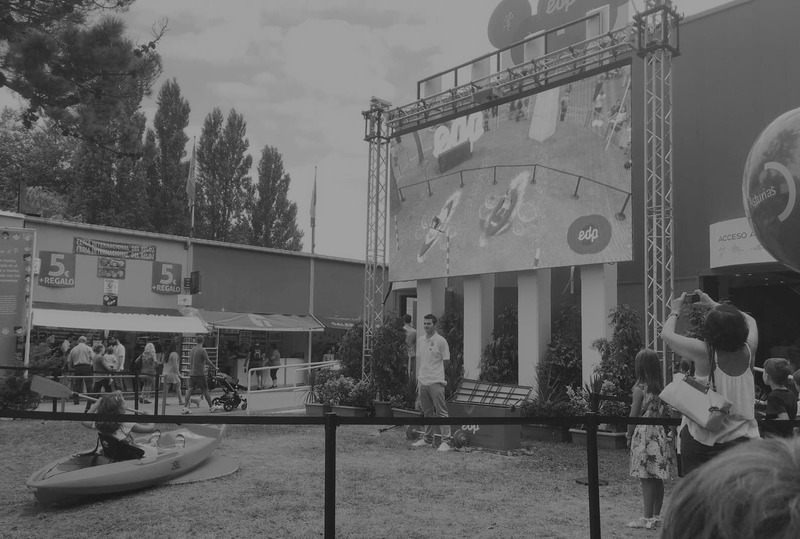 Thus, apart from the sprint race, the energy multi-national pavilion also offers challenges (locker rooms and podium included) with virtual competitors in weight-lifting, rowing, rhythmic gymnastics and fencing, which are broadcast live on a giant screen. During the first days in FIDMA, the great success of this Olympic experience developed by Cuatroochenta, was proved by the great participation recorded in all the events. Cuatroochenta has developed this augmented reality experience thanks to the recent creation of a video game department, made up by the first graduate students from the undergraduate Degree in Video games at the Jaume I University (UJI) in Castellon by means of an education cooperation agreement for R&D knowledge transfer. In addition to the augmented reality, they are also developing projects and doing research on virtual reality visits, 360 degrees sound or apps gamification. The augmented reality experience stems from the collaboration with Ros, a Basque virtual communication agency with which Cuatroochenta has established an strategic alliance. This will soon result in innovative projects with other big companies. Apart from EDP, Ros boasts significant companies among their clients such as Vaillant, Fagor, Eroski or Euskaltel. Cuatroochenta is a benchmark apps and video games developer in Spain and Central America,having seats in Panama, Bogota and Utrecht. In less than five years, it passed from 5 employees to more than 50 thanks to betting on innovation and real involvement with clients. Cuatroochenta launches web and brand to strengthen its position as a technological company in Europe and Latin America, maintaining the app development as the axis and opening the focus to the digital transformation consulting. On the horizon, the MaB. A project of El Periódico and Cuatroochenta to monetize hyperlocal media has been granted Google funding through the DNI journalism innovation program. Why has Intimind been chosen among the best 2017 apps in Latin America? Pre-Market Environment, Spanish Markets and Stock Exchanges, funding of startups, the Valencia Stock Exchange. I have read and accept the legal Notice. You can unsubscribe at any time. I want to receive periodically information on technologies aimed at improving results in companies or institutions, with particular attention to app development and digital transformation, in the European and Latin American context.